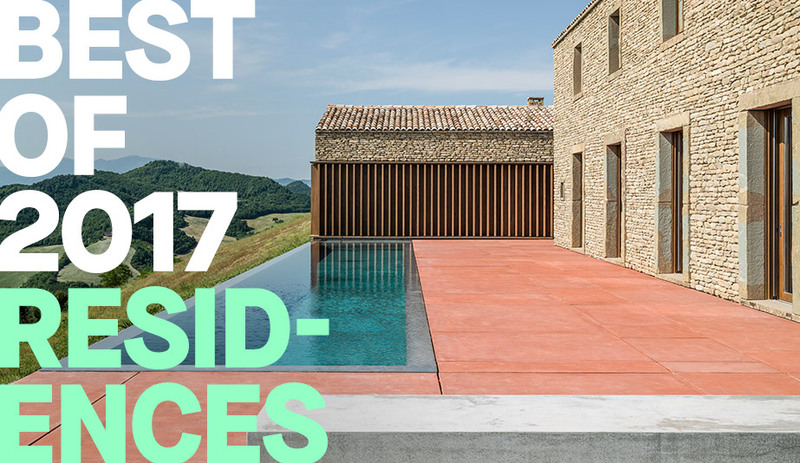 From an ingeniously stacked high-rise to an idyllic Italian retreat, the best residential buildings of 2017 encompassed all typologies. The following are 10 of our favourites. A native of Panama, architect Patrick Dillon subscribes to the practice of “slow architecture,” wherein construction methods and materials complement the natural environment rather than infiltrate or harm it. His first house, in fact, was built in a forest and is entirely off-grid. Only salvaged and local materials were used in its making and they were hauled to the site via boat and horseback. Built for a musician client, House for a Violinist is not quite so rustic, but it is a stunning example of how to build in harmony with nature. A similar palette of basic and readily available materials, including wood, metal frame work and chipboard, have been applied with a modernist’s eye. Rather than dig into the landscape, one end of the house is propped up on stilts, and the generous rooftop overhang covers the L-shaped floor plan along with a wooden veranda that wraps around half of the house, providing generous amounts of outdoor space sheltered from the sun. The apex is a central room accessed through sliding barn doors. One can easily imagine this open space becoming an idyllic spot for an intimate concert. 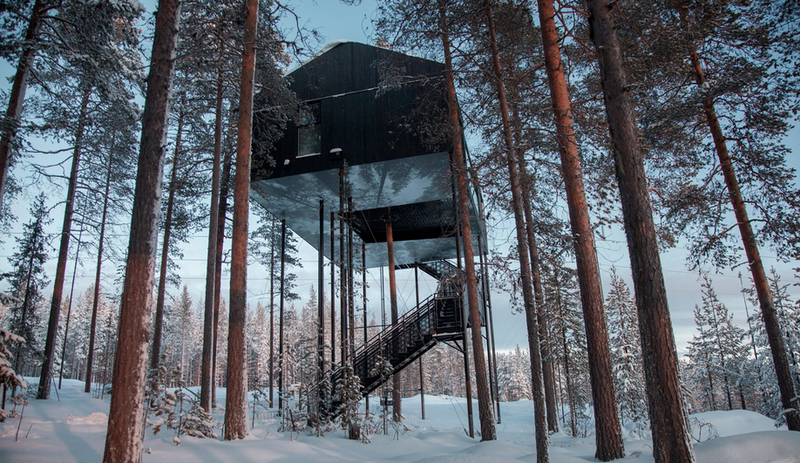 The newest treehouse to join a collection of architectural wonders comprising Sweden’s Treehotel, the 7th Room by Snøhetta is a playful home-away-from-home floating 10 metres above the ground. 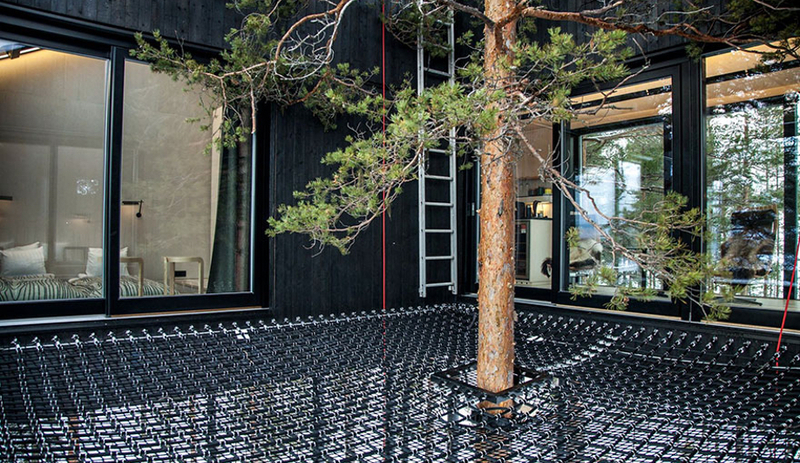 The charred-pine cabin blends into the boreal forest, while the building’s underside is clad with an aluminum panel digitally printed with a mural of the same view that surrounds the clearing: trees reaching towards the open sky. Although it’s reached via a sturdy zigzagging staircase rather than a rope ladder, the 7th Room makes up for this sensible approach with a netted terrace strung between the centre of the U-shaped structure. Ideal for stargazing or observing wildlife on the forest floor below, the net provides even better views than the sweeping panoramas offered inside through floor-to-ceiling windows. The cozy two-bedroom interior features a stereotypical Scandinavian palette of pale birch and ash on the floors and walls, plus furniture including Han Brattrud’s classic Scandia Chair. Why we like it: From below, the reflective aluminum mural blurs the cabin into the evergreen canopy, giving the treehouse real ethereality. Developing affordable housing is a challenge for every city. The Six in L.A.’s MacArthur Park stands out as an example of how to do it right. The work of local firm Brooks + Scarpa, rigorous proponents of social housing, the building is a physical embodiment of the military expression it was named after: “I’ve got your six,” meaning to have a fellow soldier’s back. 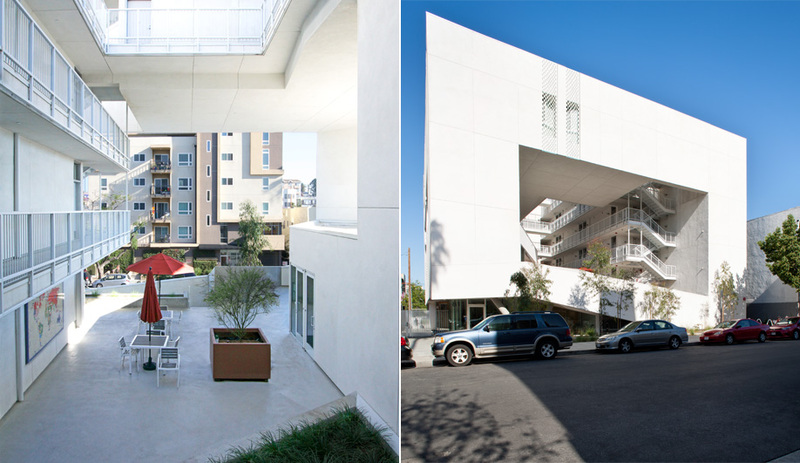 A project by the Skid Row Housing Trust, The Six comprises 52 private units, with 18 specifically allotted to disabled and previously homeless veterans. A balancing act of public and private zones, The Six offers a stable oasis in the densely populated neighbourhood. In a deliberate move, special attention was paid to the shared spaces in order to move away from isolation and reclusiveness and towards a community-focused environment that encourages interaction. Four storeys of private units wrap around a central second-floor courtyard (the ground level is comprised of offices and counselling spaces, bike storage and parking), which is visually open to the surrounding neighbourhood. The dual nature of the courtyard maintains a sense of security for the occupants while creating a strong connection to the community beyond. 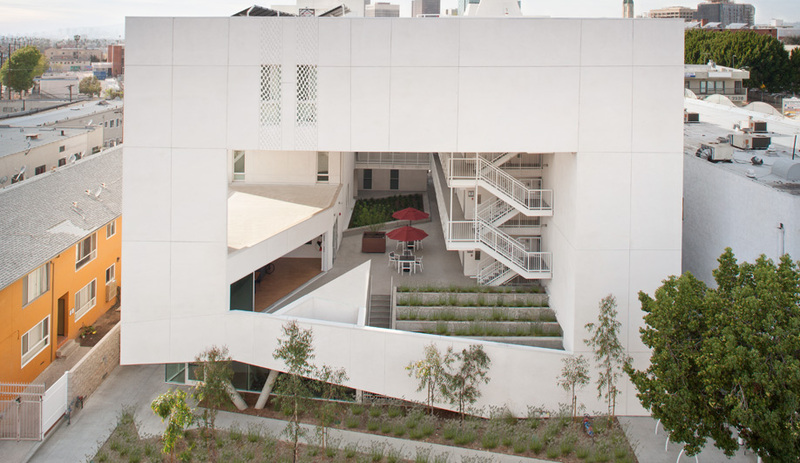 Viewed from the street, the 12,100-square-metre building makes a quiet impression thanks to its calming white stucco exterior, angular formation, stepped planters and green-roof terraces. 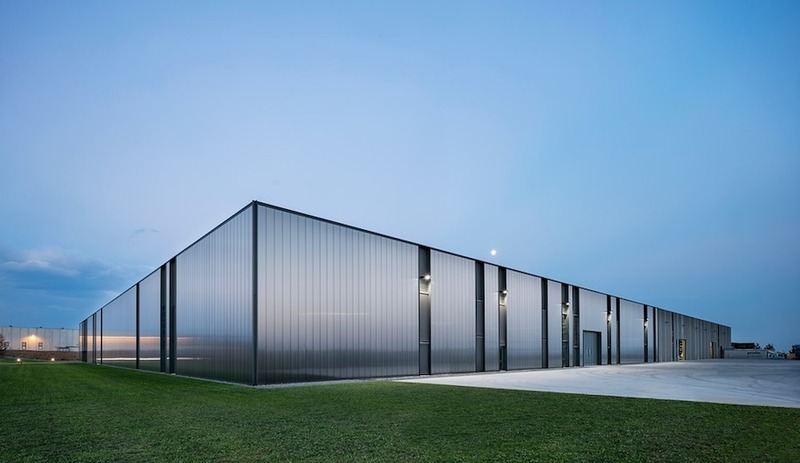 Why we like it: Apart from its social value, the building is also a model of sustainability with a low-carbon footprint; natural ventilation and geothermal and solar-assisted heading are among its attributes. Read more about the project here. If you’ve ever wondered about the residential potential of an empty storefront, you’re not alone. There’s something alluring about huge display windows, but they also come with one drawback: little privacy. 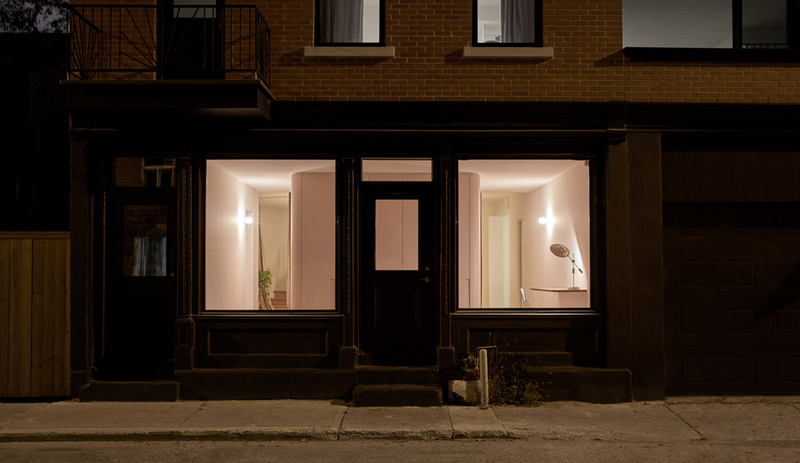 So when Atelier Barda transformed a grocery store into a single-family home in Montreal’s busy Plateau neighbourhood, privacy was top of mind. 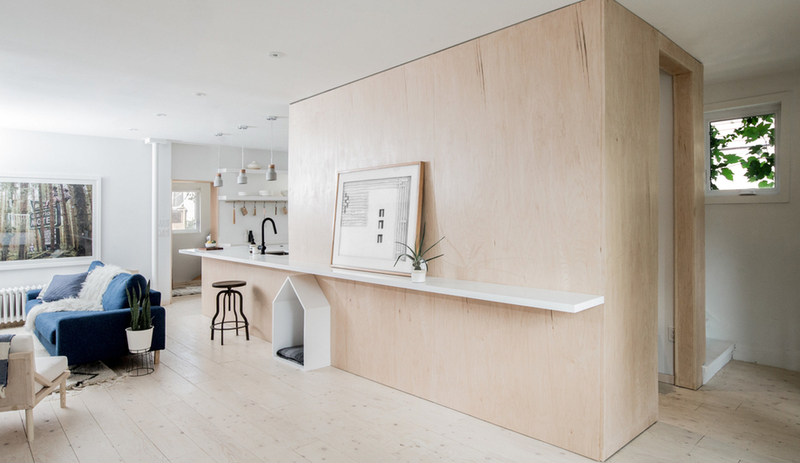 The Montreal design studio delivered a tactful, elegant redesign with Villeneuve Residence. The first thing to tackle: that façade’s two wood-framed display windows. Instead of facing a living space, the windows frame a pastel pink service block containing a powder room, bookcase and closet. To curious passersby, it offers a cinematic glimpse of what’s within – only a passageway and tiny office are revealed. The rest of the house is hidden behind a theatrical curtain, including a staircase highlighted by a slim metal rail, a living room anchored by a massive pink bookcase, an expanded second floor built atop the site’s original garage and a kitchen complemented by terrazzo-style concrete. To be sure, those interiors are gorgeous. But Atelier Barda’s real feat here is that you’d never know it from street level. Why we like it: Restraint, restraint, restraint. It would be tempting to showcase Villeneuve Residence’s interiors in all their pink-hued glory. 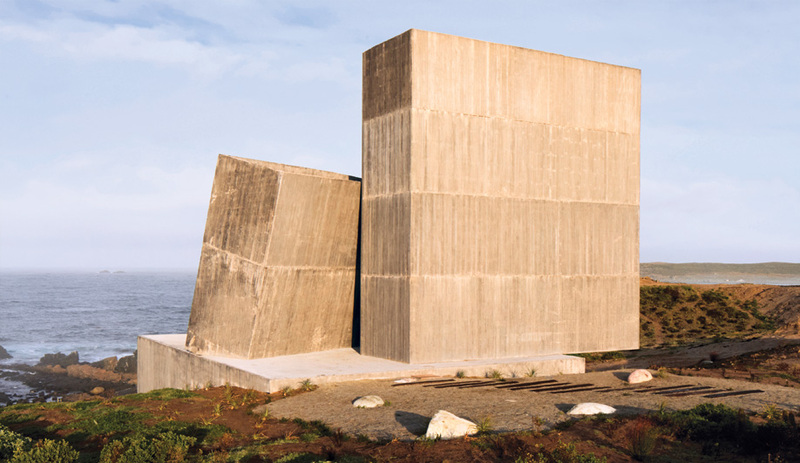 Instead, Atelier Barda’s façade doesn’t invite viewers in – it invites them to ponder about what’s within. In Peanuts, Snoopy lived in a humble dog house, the type of DIY structure built by countless fathers in countless suburban backyards. But such doggie dwellings are becoming quickly antiquated – these days, most dog owners would recoil at the thought of leaving Fido unsupervised outdoors. 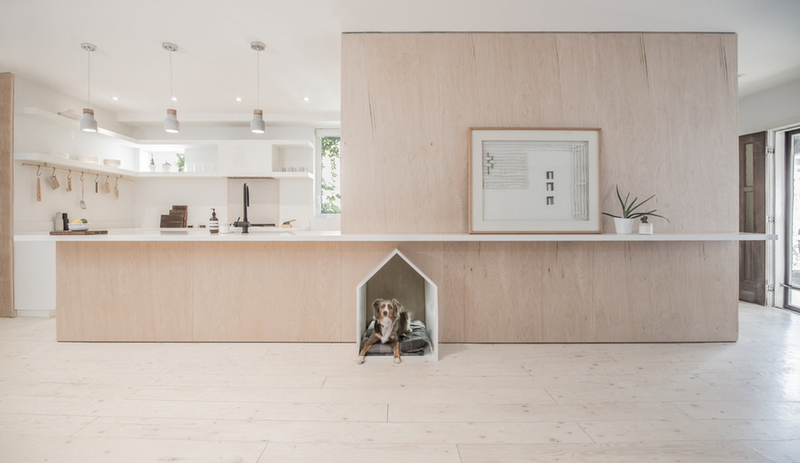 So when StudioAC was tasked with adding a dog house to a Toronto renovation, it did the logical thing: it brought it inside. StudioAC’s client didn’t only ask for a dog house, of course. Instead, they wanted to reconfigure their home’s open-concept main floor, which previously contained an entryway, living room and kitchen. The local studio responded by inserting a blonde plywood volume, which added storage and workspace while separating the room’s foyer, dining room, living space and kitchen. It’s a simple and handsome addition, but the inclusion of a pitched-roof nook – just big enough to fit the family dog – elevates Sheridan House into something exceptional. Snoopy would be proud. Why we like it: Because dogs are part of the family, too. One of the most appealing aspects of contemporary residential architecture is the the ability customize, meaning that no two houses are exactly alike. And Caring Wood is definitely a house all its own, having a uniqueness that earned it the title of House of the Year from the Royal Institute of British Architects. Its quirkiness is the result of a near-obsessive desire to pay homage to history and tradition. 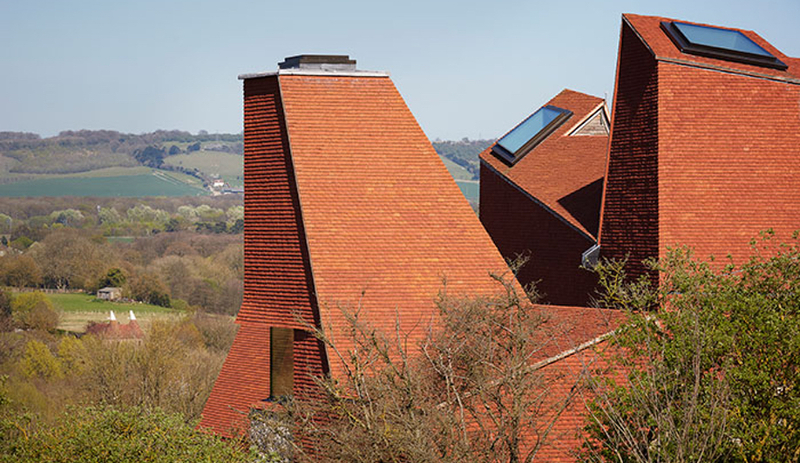 Designed by Macdonald Wright Architects of London, the 1,500-square-metre country house for a multi-generational family sports a rooftop of four tilting towers inspired by oast houses, the traditional Kent agricultural buildings once used for drying hops. 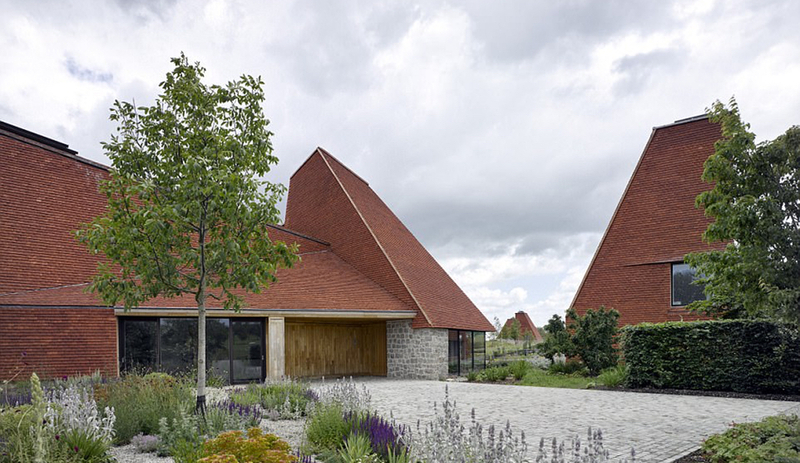 Only locally sourced materials and craftwork were used in its construction, including handmade peg tiles and regionally quarried ragstone used for the base of the building. Those terracotta shingles are handmade from clay. The project is also thoroughly green, utilizing natural ventilation, daylight and passive stack ventilation to eliminate the need for HVAC. Solar panels, EV charging and ground source heat pumps have also been worked into the project, while 25,000 trees were planted to help reforest the 84-acre property. Draped over a Quebec mountainside, this residence by Montreal firm Atelier Général is a site-specific wonder. Named La Roche (or the Rock), the house’s dark, blocky form mimics the boulders that speckle the terrain, although its pentagonal shape was devised to nestle into the site, with minimal impact on the natural landscape. 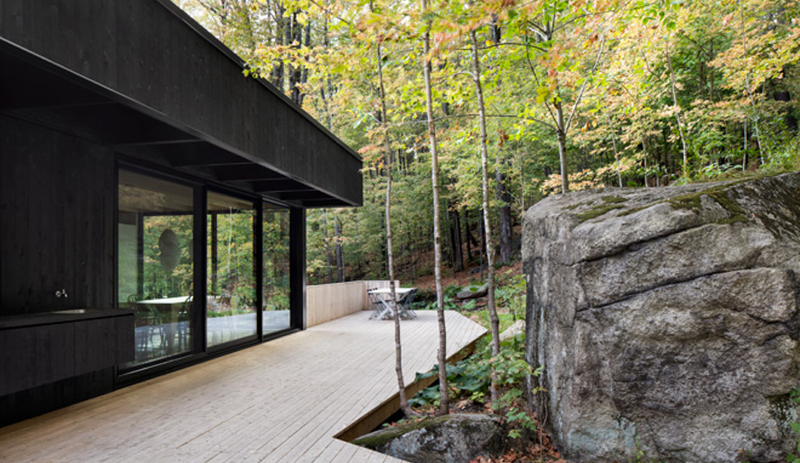 Pushing out from the hillside, the structure’s ample glazing offers intimate views of the rocky terrain from one side and overlooks a leafy treeline on the other. The main volume perches above the gravel driveway and juts out over it, supported by unexpectedly thin columns, to form a car port. Why we like it: In contrast to the blackened cladding, the interiors are awash with natural light that bounces off white walls, pale wood and polished concrete floors, all wrapped in floor-to-ceiling windows providing stunning views of nature. Vertical living has become commonplace in cities around the world, but that doesn’t mean the towers that contain us have to be. Rising 250 metres, the residential skyscraper at 56 Leonard Street in New York’s Tribeca neighbourhood is the tallest in the neighbourhood to date. More notable is the anomaly it presents. 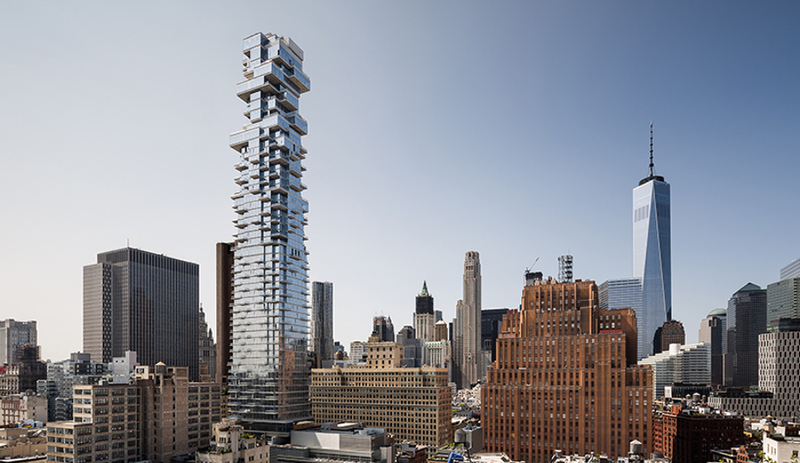 Rather than having it shoot straight up, Swiss architects Jacques Herzog and Pierre de Meuron arranged the surprisingly slender structure as a series of dynamically stacked houses, misaligning the individual units’ floor-plates as they climb. From street level, the building reads in context with its surroundings, but takes on an increasingly staggered profile as it moves upwards, with the resulting protrusions creating undulating cantilevers, terraces and balconies. The upper portion was given the boldest application: a shifted stack of 10 expansive penthouses with individual perspectives on the city below. 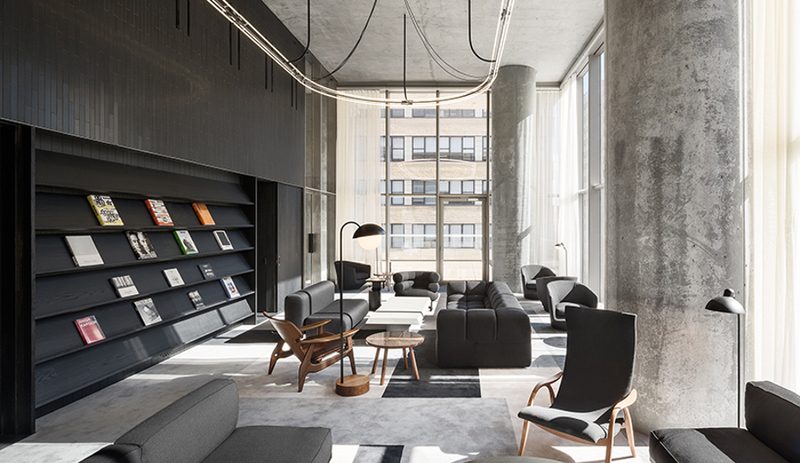 Also responsible for the interior design, the duo aimed to offer residents a living experience as diverse as the city itself, with a measured mix of private and public connections. Amenity spaces on the ninth and 10th floors, which include a 23-metre lap pool, a fitness centre with steam room, an indoor/outdoor theatre, a library and a catering kitchen, feature a rich palette dominated by concrete, wood, metal and leather. Why we like it: Embodying a refreshing approach to urbanism, 56 Leonard Street brings a unique character to a city known for its individualism. It should serve as inspiration for other developers in other cities to think outside the ubiquitous bland box. 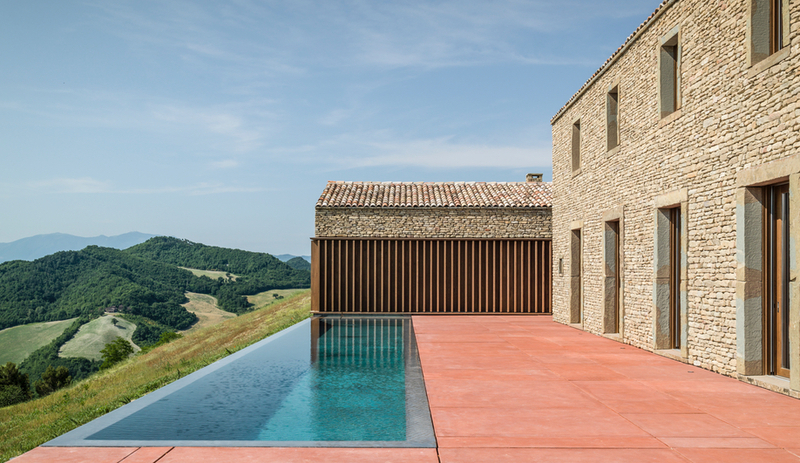 If you’ve ever harboured Under the Tuscan Sun fantasies about chucking it all and running away to Italy, prepared to be wowed: This rural getaway by the Rimini architecture firm GGA isn’t in Tuscany, but it fulfills just about every desire anyone could have about an Italian escape. And it’s a magnificent feat of architecture to boot. Located on the outskirts of Urbino, the ancient hill town in the region of Le Marche, the three-structure villa complex known as AP House was constructed on the remains of a medieval settlement. The two main structures, which comprise a single dwelling, sit independently on a 38-by-20-metre red concrete platform but are connected below grade by an underground corridor. A third building used for entertaining and storage is located nearby on an artificial hill. Inside, the fluid but clearly delineated ground level includes a living area, dining room, kitchen and studio, with direct access to the red concrete terrace and infinity pool outside provided by large, glass-paneled floor-to-ceiling doors. 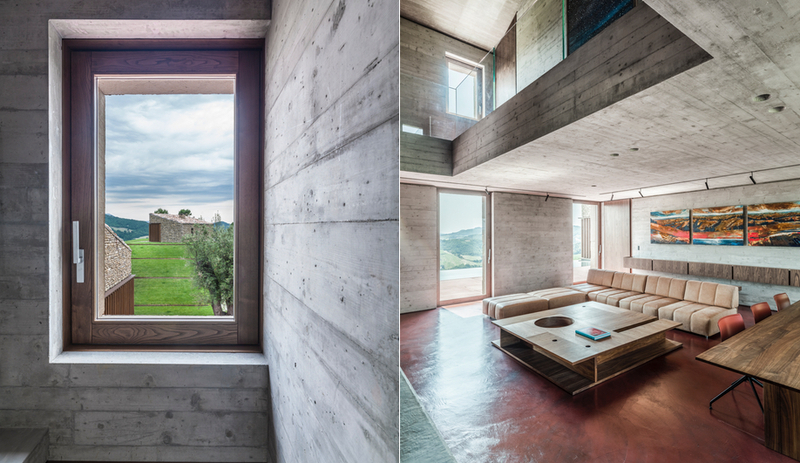 Overall, the villa creates “a direct and empathic dialogue,” as GGA principals Alice Gardini and Nicola Gibertini describe it, between the new buildings and their setting, bringing new activity and another form of beauty to a richly layered site. Why we like it: Many villages and hamlets around the world have been struggling in recent years to retain their populations and relevance in a modernizing world. 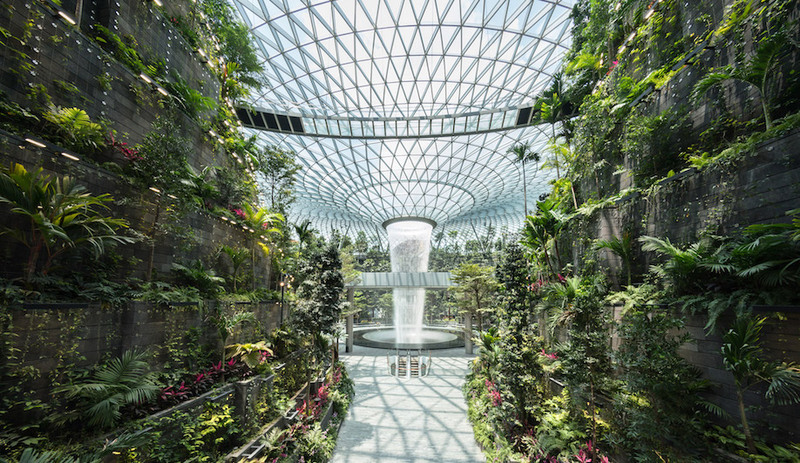 This project shows how cultural heritage and contemporary architecture can harmonize and shine. Shipping containers have been retrofitted in recent years for all manner of pop-up shops, galleries, workspaces and even hotels. 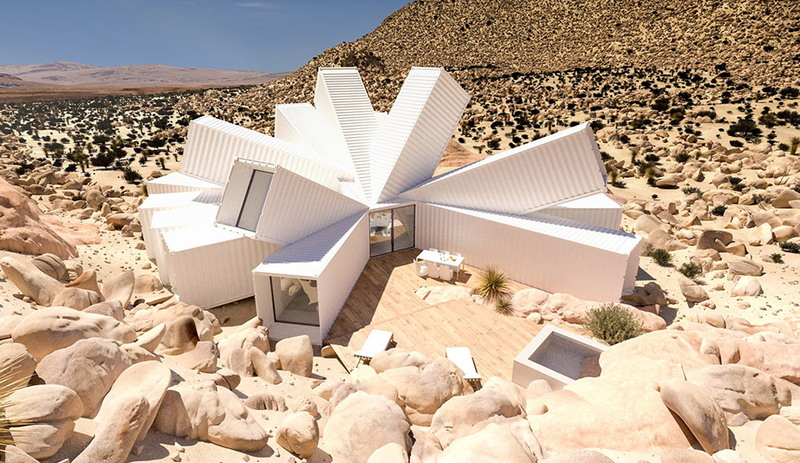 But the award for the most innovative – not to mention beautiful – container repurposing has to go to London-based Whitaker Studio‘s proposed vacation home in the California desert for film producer Chris Hanley. 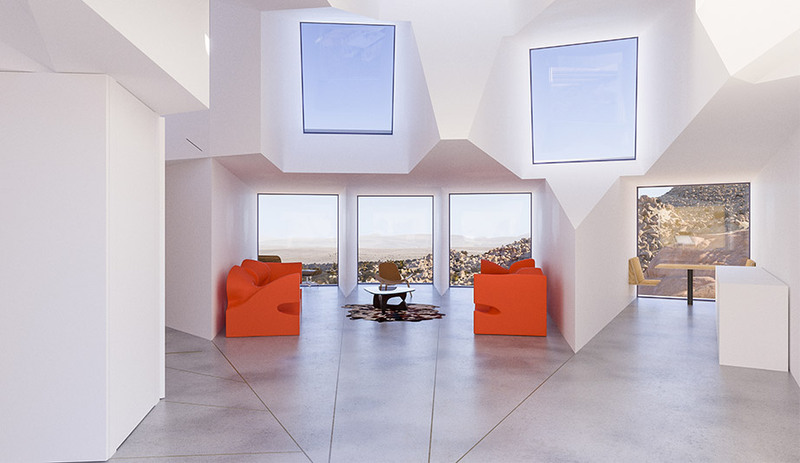 Although construction has yet to begin, the project became a minor Internet sensation in 2017, which is only appropriate, since Hanley first became smitten with the design when a friend who was visiting his desert property showed it to him on her laptop. 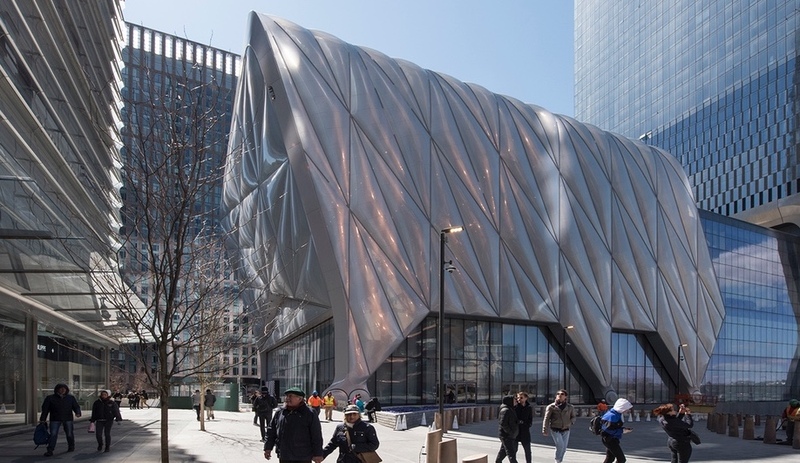 The approximately 185-square-metre, starburst-shaped structure was initially designed by James Whitaker for a startup ad agency, but it was never built. 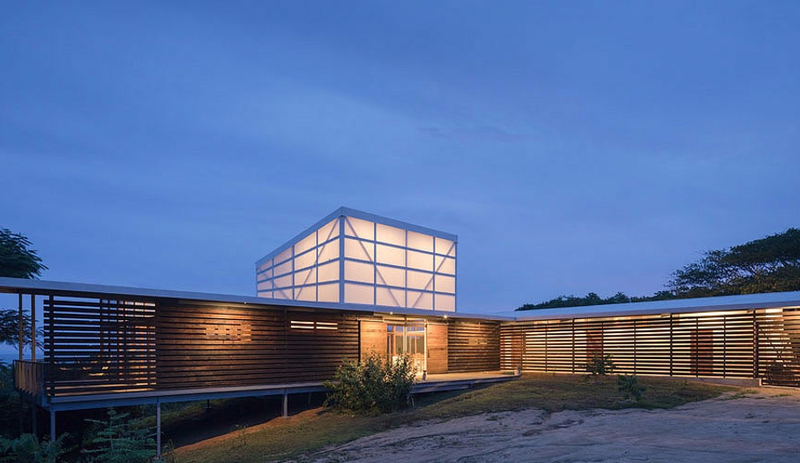 For Hanley’s retreat, at least a dozen shipping containers will be nestled in a gully created by stormwater, angled in various directions to capture views or provide privacy. The home will include a living room, a kitchen and three ensuite bedrooms. A garage with a solar panel roof will power the dwelling, which is slated to rise in Joshua Tree in 2018. Why We Like It: Even if it’s never built, Whittaker’s design has turned on a global audience to the many forms that housing – as well as shipping containers – can take.